Comments: John Adkins Moulton was born on April 30, 1895, in Richmond, Virginia. He was the son of William Thomas and Daisy D. (Adkins) Moulton, and served in the United States Army during World War I. He graduated as a 2nd Lieutenant from the Engineer Officer Candidate School for the American Expeditionary Force in France on November 30, 1918. While John was in France, Daisy, his mother, passed away. 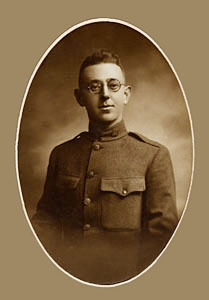 After his discharge from the Army in July 1919, John moved to Scottsville with his father, who had purchased Jefferson Mills two months earlier. Jefferson Mills is located approximately three miles northeast of town by the Hardware River, and John helped his father operate the mill, which produced flour, cracked corn, corn meal, and other milled products. The Moultons also opened a flour, feed, and seed store called 'Jefferson Mills' on Main Street in Scottsville. It was located in the old Canal turning basin across from today's Scottsville Museum. This store frequently flooded with Mink Creek high waters, and in 1940 John moved the store to the first floor of the old Braid Factory on Valley Street This building had remained dry in previous Scottsville floods, but during the floods of 1942 and 1944, water reached the Braid Factory for the first time. The Moultons moved all of the Jefferson Mills store produce to a higher floor until the waters subsided and flood cleanup was completed. When John arrived in Scottsville, he met Innes Roberta Harris, the daughter of Percy and Innes (Randolph) Harris. Innes was born on October 4, 1905, in Howardsville, Virginia, and graduated from Scottsville High School. John and Innes were married on June 28, 1923, in Washington, D.C., and returned to Scottsville to make their home. They first lived at Jefferson Mills on the Hardware River and then over the store on Main Street. In 1934, they moved to the renovated, old Creamery on West Main Street. Shown at right, the Creamery was formerly the home of Dr. and Mrs. Percy Harris, Sr.
John and Innes were the parents of two children: John Adkins Moulton, Jr. (1924-1929), and Randolph 'Ranny' Harris Moulton (1930- ), who is shown at right in this 1955 photo taken as he graduated from the University of Virginia. Ranny recalls his family battling frequent flood waters at their Creamery home. "We watched the water coming up the baseball diamond behind us. When it got to second base, we prepared to move out of the house." Ranny also remembers riding up and down Main Street in small boats during flood time in Scottsville. 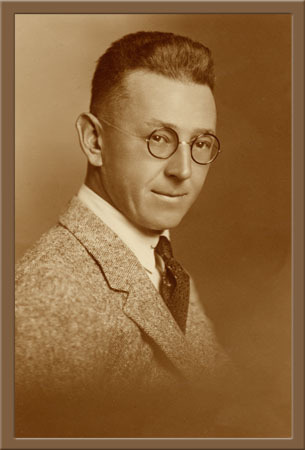 John Adkins Moulton died on September 14, 1950, in Scottsville. 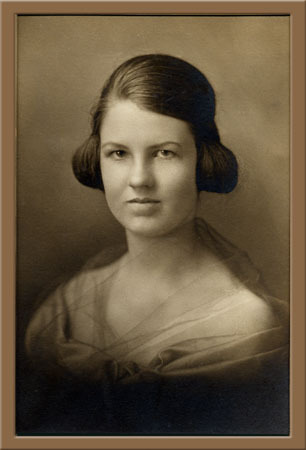 Innes (Harris) Moulton continued to live in Scottsville until 1955 when she sold their Creamery home and moved to Charlottesville, Virginia. Innes was a hostess at Monticello from 1955-1970. Innes died on April 27, 2003, in Charlottesville, VA.
Their son, Randolph, married Gail Kathryn Rogers on September 7, 1963, in Rochester, NY. Gail was born on August 23, 1938, in Rochester. In 2005, Randolph and Gail Moulton lived in Macon, Georgia, and they are the parents of two children: 1) Kathryn Innes Moulton, born July 11, 1964, Arlington, VA; married Nils E. Ericson on December 27, 1986; and 2) John Randolph Moulton, born July 29, 1966, Atlanta, GA; married Stephanie J. Usleman on June 27, 1998. These photos are part of the Ranny Moulton collection. 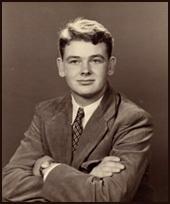 Ranny resides in Macon, Georgia, and is the son of John Adkins Moulton and Innes Roberta (Harris) Moulton.